I’m so thrilled to be healthy again, that I’m doing a happy dance (see the video below if you want to witness it.) The pneumonia is gone and my boys are back in school. Can I get a “Woot Woot!”? Are you amazed? I used almost all of the pallet wood and scraps that I had lying around my workshop! 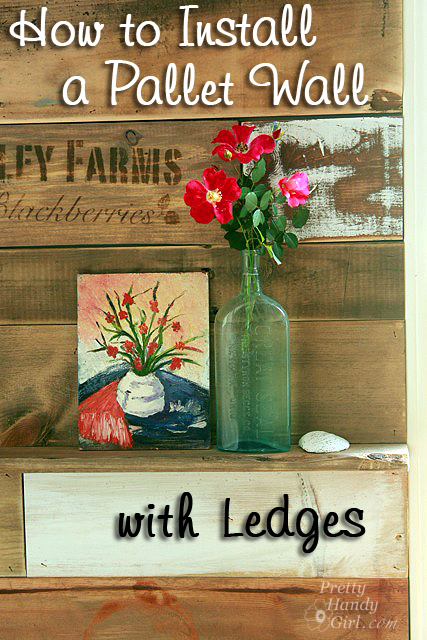 I purchased just a few 1″ x 4″ pine boards for the ledges. Then made those new boards look old! The back wall of this room is one of the only vertical spots to hang artwork in the room. In addition to making it a feature wall, I wanted to maximize the art hanging space with some ledges. You can see some of the other amazing salvage wood walls I used for inspiration in my Pinterest board. Now, are you ready to learn how to install a wood plank wall plus a few tips and tricks for cutting all those boards and angles? There is some controversy about the safety of using pallet boards. Before I took on this project, I did a little research and ultimately decided to take the risk. I recommend you do your own google search and decide which information is relevant for your project. Originally I was going to seal the wall with polycrylic. But, in the end I decided not to because I liked the colors and look au natural. If you are nervous about potential chemicals—or potential hazards of pallet wood—go ahead and paint or seal your wall. Before you begin, make sure to remove your baseboard trim. Start from the bottom and choose scraps the same width to run along the width of the wall. Use the level to check each board. Squeeze some construction adhesive onto the back of your board. Place the board onto the wall. Check and make adjustments to level the board. Add a shim if you need to keep the board leveled. Fire a few finish nails into the board to secure it. To install a ledge, cut your ledge to the same width as the row beneath it. Lay it on top of the last row and check that it is level. To make cuts around outlets or light switches: 1. Mark the width of the outlet plate (plus extra to account for the beveled angle). 2. Measure the height of the plate. 3. Transfer the height measurement onto the board. 4. Cut out the notch using an angled Dremel Multi-Max wood cutting blade (or jigsaw). And…the moment y’all have been waiting for…the full reveal! I can’t even begin to tell you what a huge difference this wall has made in the room. It is warm and it inspires me to want to create more art to fill up those ledges. Have a great weekend! I’ll be working on finishing the art and craft room. Stay tuned for a few more tutorials and the final reveal! Disclosure: This post is a sponsored post paid for by 3M DIY. I was not told what to write or what project to create. The ideas and tutorials are my own. This post is brought to you in partnership with 3M DIY. Learn how to work smart and be prepared at 3MDIY.com. *Content and/or other value provided by our partner, 3M Frameworks. This wall transformation is stunning….can’t wait to try it! Are you using brading nails or staples to adhere the board to the wall? I would like to do this project, but I don’t know which type of nail gun to buy. Finish brad nails 2″ long. This wall is wonderful. Do you remember the color that you used on some of the blue and green boards that are on your wall?.